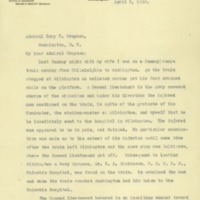 Thomas Woodward writes to Cary Grayson about a Marine second lieutenant who was injured on a train platform. He is concerned for his medical care and insulted by how he was treated when trying to give aid. Last Sunday night with my wife I was on a Pennsylvania train coming from Philadelphia to Washington. As the train stopped at Wilmington an enlisted marine got his foot crushed while on the platform. A Second Lieutenant in the Army assumed charge of the situation and under his direction the injured man continued on the train, in spite of the protests of the Conductor, the station-master at Wilmington, and myself that he be immediately sent to the hospital in Wilmington. The injured man appeared to be in pain, and fainted. No particular examination was made as to the extent of his injuries until some time after the train left Wilmington and the next stop was Baltimore, where the Second Lieutenant got off. Subsequent to leaving Wilmington a Navy Surgeon, Dr. CD Sinkinson, USNRF, Columbia Hospital, was found on the train. He examined the man and when the train reached Washington had him taken to the Columbia Hospital. The Second Lieutenant behaved in an insulting manner toward me when I ventured to protest not sending the man to a hospital in Washington. To me and some other passengers the action on the part of the officer who assumed control of the situation appeared to be gross negligence and disregard for the welfare of the injured marine. The Lieutenant’s bearing toward me as a civilian who ventured to protest was worthy of the traditions of the Prussian Army. It seemed to me that both the Navy and War Departments should be apprised of the incident so that they might investigate if they saw fit. However, I am submitting that matter to you to do with it as you think best. I could not get the Lieutenant’s name as he refused my card, but his insignia showed him to be a Second Lieutenant US Infantry 311. The Conductor’s name was WH Hopkins and the train Pennsylvania RR No. 129. First Lieutenant TD Cope (S, S & R) stationed at Washington also witnessed the incident. Enclosure: A more detailed statement. On Sunday night, , I was with my wife on Pennsylvania Railroad train No. 129, Conductor WH Hopkins, which was scheduled to leave West Philadelphia at 7.39 p.M. and to arrive in Washington at p.M. The train was crowded, largely with soldiers and marines, and many were standing in the aisles. My wife was seated on the fifth seat from the front of the car, next to the aisle, on the right hand side of the train and I was standing in the aisle by her side. Some soldiers or marines were standing on the front platform of the car. The man’s shoe was not removed or his foot examined carefully to ascertain the extent of the injury until the train had left Wilmington and the next scheduled stop was Baltimore. After the train started someone—I think it was the Conductor,—produced first aid materials. The man’s shoe was then removed and these dressings applied. A woman tried to make the hurt man comfortable. I remarked to the Lieutenant that if necessary I should carry the incident to the Secretary of War. He took a seat immediately behind me, and subsequently got off at Baltimore. The conductor came through the train and asked who had seen the accident. I gave him my name and told him what I had seen and heard. He also gave me his name, W. H. Hopkins, and train number. He told me that both he and the station-master at Wilmington had pleaded with the injured man to go to the hospital while he stood on the platform at Wilmington, but that he had refused. Before we reached Baltimore I overheard the Lieutenant remark that Dr. Grayson’s Secretary was at the front of the car near the man. I went and spoke to the man indicated, as I have some acquaintance with Dr. Grayson. He told me he was in the Surgeon General’s Office. There was a man in Naval uniform standing by him, apparently a doctor, who said he had examined the injured foot and that no bones seemed to be broken but that the great toe was crushed. This examination was made after leaving Baltimore, as the naval doctor did not appear on the scene until after the train started. The train arrived at Washington about 12.30 p.M., so late that the soldiers on board from their remarks were convinced that they had missed their train leaving Washington for their Camp, and that they would be penalized on return to Camp. As the passengers were passing down the aisle, I heard someone ask the injured marine, who was still sitting with foot extended, how he felt. He replied: “It is a pretty bad smash.” As I got off the train I spoke to the young navy doctor and he assured me that he would take care of the injured man. Woodward, Thomas M., “Thomas M. Woodward to Cary T. Grayson,” 1918 April 2, WWP22312, Cary T. Grayson Papers, Woodrow Wilson Presidential Library & Museum, Staunton, Virginia.